The Lassco Wizer CR-50B Round Cornering Machine is a heavy duty table top round cornering unity for larger sheet size applications and plastic products. With it’s shear action cutting for hard-to-do jobs, the Model CR-50B handles up to 1/2 inch of stock per cut depending on the material being cut. The CR-50B cornering machine has a table size of 9″ x 18″ to handle large products. One of four standard size cutting units is included with the purchase of the CR-50B giving you the versatility you demand. The standard sizes include: 1/8″, 1/4″, 3/8″, or 1/2″ and additional cutting units can be added to machine to offer a variety of corner sizes. The CR-50B is lightweight and very portable, only weighing about 9 pounds. This commercial medium duty round cornering machine is constructed of heavy steel and a wooden top-plate for long lasting durability. The CR-50B round cornering machine is ideal for print shops and corporations with their own in-house print shops. If you have any questions or are interested in the CR-50B Round Cornering Machine, visit us at SpiralBinding.com. 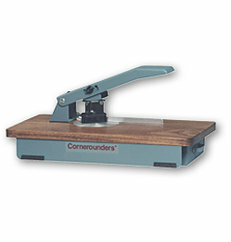 We have great pricing on a full line of Round Cornering Machines. Call us at 1-800-631-3572 for more information!